In their sufferings, O Lord, Thy martyrs received imperishable crowns from Thee, our God; for, possessed of Thy might, they set at nought the tormenters and crushed the feeble audacity of the demons. By their supplications save Thou our souls. 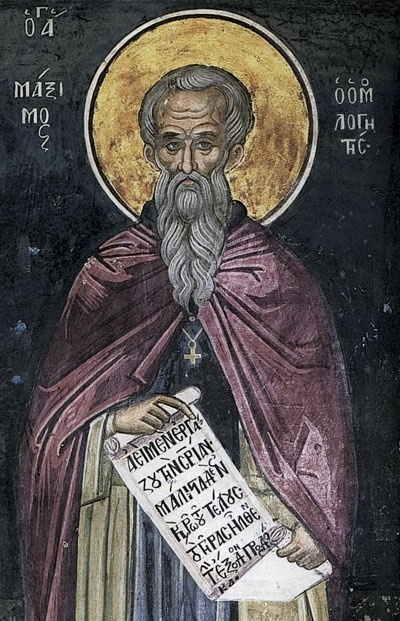 O instructor of Orthodoxy, teacher of piety and purity, beacon of all the world, divinely inspired adornment of monastics: O all-wise Maximus, by thy doctrines thou hast enlightened all O harp of the Spirit, entreat Christ God, that our souls be saved. 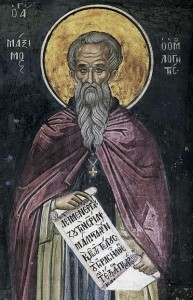 The thrice-radiant Light which abode in thy soul showed thee to be a chosen vessel revealing divine things to the ends of the earth, O blessed Maximus, who givest utterance to concepts hard to grasp and manifestly proclaimest the transcendent and unoriginate Trinity unto all. Please sign up for coffee fellowship/kitchen cleanup. Your help is needed and much appreciated! New time for Saturday Great Vespers – 6.00 pm! Choir practice on Saturday, 5.00 pm. No adult education class this week! Have some frozen yoghurt at the Yogurt Hut fundraiser, 12-4 pm next Sunday (the 19th)! Don’t forget to sign up for the retreat at Box R Ranch! On August 12 we read I Corinthians 4: 9-16. In these verses Paul talks to the Christians of Corinth with sarcasm and severity. In verse 8 he has used the word “already” to express his feelings. The Corinthians apparently feel they already have the fullness of the faith and have already become rich. Paul says, “Without us you have become kings! And would that you did reign, so that we might share the rule with you!” In other words, if the Corinthians have achieved the fullness of salvation, they should take Paul and the other hard-working preachers to reign with them in the Kingdom. Verses 9 and 10 remind the Corinthians of the sufferings of those preachers and teachers, contrasting them to the virtues of the Corinthians themselves. The preachers are fools, weak, and held in disrepute. Corinth’s believers are wise, strong and held in honor. Of course Paul is being ironic here—these virtues are only what the Corinthians imagine they possess. This is not the only part of this letter in which Paul has scolded the Corinthian Christians for having puffed-up ideas about themselves. In 1:26 he tells them, “…not many of you were wise according to worldly standards, not many were powerful, not many were of noble birth; but God chose what is foolish in the world to shame the wise.” They were chosen by God, Paul is telling them, and not because they were anything special, but because He is merciful. In today’s verses, 4:11-13, Paul vividly describes the sacrifices that he and others have made to spread the Gospel. The efforts of these hungry, thirsty, ill-clad, buffeted, homeless people who labor to support themselves have left them as “the refuse of the world, the offscouring of all things.” Despite this, they have blessed those who reviled them. They have endured persecution, and tried to conciliate when they are slandered. Paul wants the proud Corinthians to remember all these things that he and others have done and endured for them. He doesn’t want them to go on believing that everything good that has come to them has been the result of their own efforts or virtues. In the next verse Paul’s tone changes abruptly; his words no longer have a hard edge. He assures the Corinthian believers that he has not directed such harsh words at them in order to shame them, “but to admonish you as my beloved children.” Though disappointed, Paul is still the father whose heartfelt wish is the salvation of his children in Christ. He tells them he is not just one of the “countless guides in Christ” they may know—people who observe the basics of belief and worship. 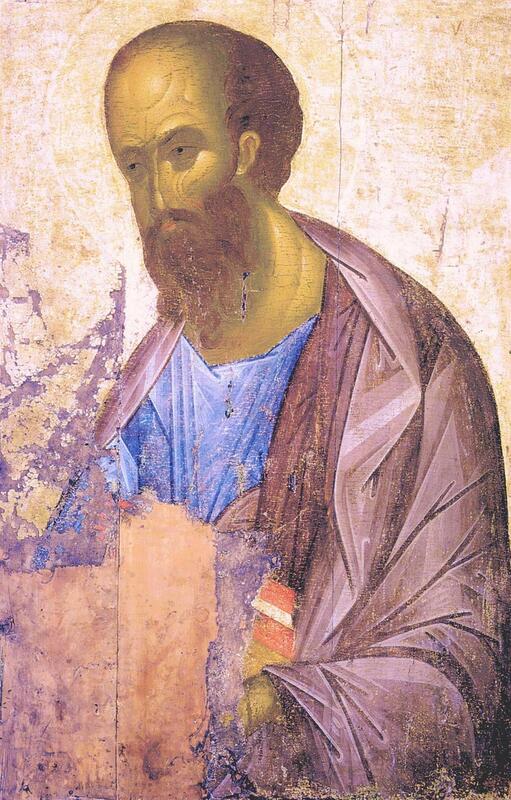 Paul is the one who has sacrificed and suffered for them, as only a father would.